Inspired by the popular Fountain Tarot, but adaptable for use with any tarot deck, the book includes instructions on how to read tarot for beginners, including an introduction to tarot basics and detailed sample spreads and readings. Once you’ve mastered Tarot 101, The Fountain Tarot Journal then helps you turn your deck into a weekly practice that can help reveal your growth, obstacles, and key patterns in your life—empowering you with a greater sense of clarity and self-understanding. Draw a card and journal as you set your intention for each week, before setting a goal or making a major life change, or whenever you need more reflection, connection, or peace of mind. 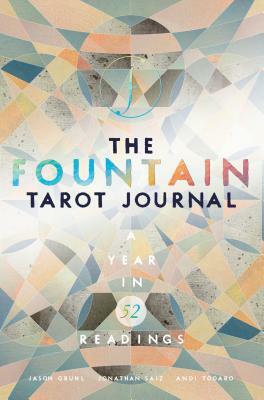 Whether you’re looking to expand your tarot knowledge or integrate tarot into your daily life, The Fountain Tarot Journal is here to help. JASON GRUHL is the former executive director and founder of The Joshua School (a school for children with Autism Spectrum Disorders and Developmental Disabilities in Boulder and Denver, CO). Jason holds a Master's degree in counseling psychology and a Bachelor's degree in English and Psychology, and dedicates his life to self-discovery through meditation and reflection. ANDI TODARO is a graphic designer whose projects have taken her across the US and into Europe: from her recent work with MSNBC in NYC for their coverage of "The Feast," to her designs for the "Belle Epoque" and "Bollywood" Galas of the American School of Paris. JONATHAN SAIZ's paintings and sculptures are in private and commercial collections worldwide and are exhibited in the US and the UK.